Tabby’s Star, the explanation that has everyone so intrigued, is that an alien civilization may be building a megastructure. Beginning tonight (October 26, 2016), and over two more nights more in the coming two months, astronomers will use the Green Bank radio telescope in rural West Virginia to observe Tabby’s Star. Tabby herself – astronomer Tabetha Boyajian, formerly of Yale and now at Louisiana State University – will be there to help lead the observations. 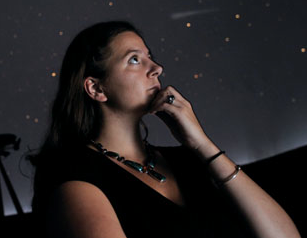 Her Ted Talk earlier this year created a sensation when she called this star “the most mysterious in the universe.” Beginning tonight, the Breakthrough Listen project at University of California Berkeley is devoting eight hours per night for three nights to observing Tabby’s Star with the Green Bank telescope. The astronomers admit it’s a long-shot, but they want to see if this telescope can detect signals from a possible extraterrestrial civilization that might – or might not – reside on a planet orbiting this star. The astronomers will also be doing a live chat from Green Bank Observatory today starting at 2000 UTC (4 p.m. Eastern, 1 p.m. Pacific; translate to your time zone) about the upcoming observations of Tabby’s Star. KIC 8462852 (also Tabby’s Star or WTF Star) is an F-type main-sequence star located in the constellation Cygnus approximately 454 parsecs (1,480 ly) from Earth. Unusual light fluctuations of the star were discovered by citizen scientists as part of the Planet Hunters project, and in September 2015 astronomers and citizen scientists associated with the project posted a preprint of a paper on arXiv describing the data and possible interpretations. The discovery was made from data collected by the Kepler space telescope, which observes changes in the brightness of distant stars to detect exoplanets. Several hypotheses have been proposed to explain the star’s large irregular changes in brightness as measured by its unusual light curve, but none have fully explained all aspects of the curve. The leading hypothesis, based on a lack of observed infrared light, posits a swarm of cold, dusty comet fragments in a highly eccentric orbit. Another hypothesis is that of a large number of small masses in “tight formation” orbiting the star. It has been speculated that the changes in brightness could be signs of activity associated with intelligent extraterrestrial life constructing a Dyson swarm. The SETI Institute‘s initial radio reconnaissance of KIC 8462852, however, found no evidence of technology-related radio signals from the star. KIC 8462852 is not the only star that has such large irregular dimmings. However, all other such stars are young stellar objects called YSO dippers that have different dimming patterns. An example of such an object is EPIC 204278916. The names “Tabby’s Star” and “Boyajian’s Star” refer to the initial study’s lead author, Tabetha S. Boyajian; KIC 8462852 is also known as the “WTF Star”, after the study’s subtitle “Where’s The Flux?” (a joking reference to the colloquial expression of disbelief “WTF”). Map showing location of NGC 6866. KIC 8462852 is northeast between NGC 6866 and ο¹ Cygni. KIC 8462852 in Cygnus is located roughly halfway between the major visually apparent bright stars Deneb (α Cyg, α Cygni, Alpha Cygni) and Delta Cygni (δ Cyg, δ Cygni) to the eye as part of the Northern Cross. KIC 8462852 is situated south of Omicron¹ Cygni (ο¹ Cygni, 31 Cygni), and northeast of the star cluster NGC 6866.While only a few arcminutes away from the cluster, it is unrelated and closer to the Sun than it is to the star cluster. With an apparent magnitude of 11.7, the star cannot be seen by the naked eye, but is visible with a 5-inch (130 mm) telescope in a dark sky with little light pollution. KIC 8462852 was observed as early as the year 1890. The star was cataloged in the Tycho, 2MASS, UCAC4 and WISE astronomical catalogs (published in 1997, 2003, 2009 and 2012, respectively). The main source of information about the luminosity fluctuations of KIC 8462852 is the Kepler space observatory. During its primary and extended mission from 2009 to 2013 it continuously monitored the light curves of over 100,000 stars in a patch of sky in the constellations Cygnus and Lyra. Observations of the luminosity of the star by the Kepler space telescope show small, frequent, non-periodic dips in brightness, along with two large recorded dips in brightness appearing to occur roughly 750 days apart. The amplitude of the changes in the star’s brightness, and the aperiodicity of the changes, mean that this star is of particular interest for astronomers. The star’s changes in brightness are consistent with many small masses orbiting the star in “tight formation”. The first major dip, on 5 March 2011, obscured the star’s brightness by up to 15%, and the other (on 28 February 2013) by up to 22%. In comparison, a planet the size of Jupiter would only obscure a star of this size by 1%, indicating that whatever is blocking light during the star’s major dips is not a planet, but rather something covering up to half the width of the star. 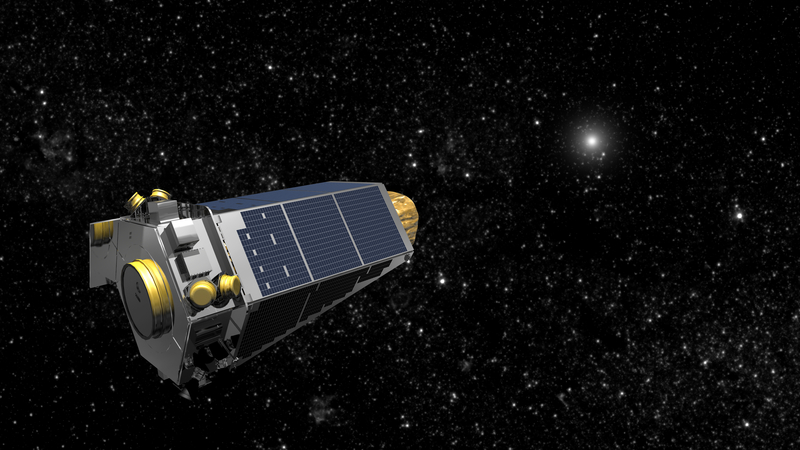 Due to the failure of two of Kepler‘s reaction wheels, the star’s predicted 750-day dip around April 2015 was not recorded; further observations are planned for May 2017. The irregular light dips do not show a pattern. In addition to the day-long dimmings, a study of a century’s worth of photographic plates suggest the star has gradually faded from 1890 to 1989 by about 20%, which would be unprecedented for any F-type main sequence star. However, teasing accurate magnitudes from long-term photographic archives is a complex procedure, requiring adjustment for equipment changes, and is strongly dependent on the choice of comparison stars. A contrasting study, examining the same photographic plates, concluded that the possible century-long dimming was likely a data artifact, and not a real astrophysical event. A third study, using light measured by the Kepler observatory over a four-year period, determined that KIC 8462852 dimmed at about 0.34 percent per year before dropping dramatically by about 2.5 percent in 200 days. It then returned to its original slow fade rate. The same technique was used to study 193 stars in its vicinity and 355 stars similar in size and composition to KIC 8462852. None of these stars exhibited such dimming. Based on KIC 8462852’s spectrum and stellar type, its changes in brightness could not be attributed to intrinsic variability; while a few hypotheses have been proposed involving material orbiting the star and blocking its light, none of these fully fit the observed data. 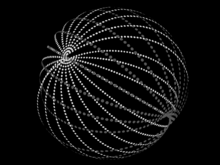 Some of the proposed explanations involve instrument or data artifacts, interstellar dust, a series of giant planets with very large ring structures, a recently captured asteroid field, the system undergoing Late Heavy Bombardment, and an artificial megastructure orbiting the star. Astronomer Jason Wright (who was consulted by Boyajian) and others who have studied KIC 8462852 have suggested in a follow-up paper that if the star is younger than its position and speed would suggest, then it may still have coalescing material around it. A 0.8–4.2 micron spectroscopic study of the system using the NASA Infrared Telescope Facility (NASA IRTF) found no evidence for coalescing material within a few astronomical units of the mature central star. High-resolution spectroscopy and imaging observations have also been made, as well as spectral energy distribution analyses using the Nordic Optical Telescope in Spain. A massive collision scenario would create warm dust that glows in infrared wavelengths, but there is no observed excess infrared energy, ruling out massive planetary collision debris. Other researchers think the planetary debris field explanation is unlikely, given the very low probability that Kepler would ever witness such an event due to the rarity of collisions of such size. As with the possibility of coalescing material around the star, spectroscopic studies using the NASA IRTF found no evidence for hot close-in dust or circumstellar matter from an evaporating or exploding planet within a few astronomical units of the central star. Similarly, a study of past infrared data from NASA’s Spitzer Space Telescope and Wide-field Infrared Survey Explorer found no evidence for an excess of infrared emission from the star, which would have been an indicator of warm dust grains that could have come from catastrophic collisions of meteors or planets in the system. This absence of emission supports the hypothesis that a swarm of cold comets on an unusually eccentric orbit could be responsible for the star’s unique light curve, but more studies are needed. One proposed explanation for the reduction in light is that it is due to a cloud of disintegrating comets orbiting the star elliptically. Under this scenario, gravity from a nearby star may have caused comets from KIC 8462852’s Oort cloud to fall in-system. Evidence supporting this hypothesis includes an M-type red dwarf within 132 billion kilometers (885 AU) of KIC 8462852. However, the notion that disturbed Oort cloud comets orbiting elliptically close to the star could exist in high enough numbers to obscure 22% of the star’s observed luminosity has been doubted. Submillimetre wavelength observations searching for farther-out cold dust in the system’s Kuiper Belt suggest that a distant “catastrophic” planetary disruption explanation is unlikely; the possibility of a disrupted Kuiper Belt scattering comets into the inner system is still to be determined. Astronomer Jason Wright and others who have studied KIC 8462852 hypothesized that the objects eclipsing the star could be parts of a megastructure made by an alien civilization, such as a Dyson swarm, a hypothetical structure that an advanced civilization might build around a star to intercept some of its light for their energy needs. Due to extensive media coverage on this matter, KIC 8462852 has been compared by Kepler‘s Steve Howell with KIC 4110611, another star with an odd light curve (which proved, after years of research, to be a part of a five-star system). Regarding the current light curve data of KIC 8462852, Wright has emphasized the importance of upcoming spectral studies. According to Wright, the likelihood of extraterrestrial intelligence being the cause of the dimming is very low; however, the star remains an outstanding SETI target because natural explanations have yet to fully explain the dimming phenomenon. Many optical telescopes are monitoring KIC 8462852 in anticipation of another multi-day dimming event, with planned follow-up observations of a dimming event using large telescopes equipped with spectrographs to determine if the eclipsing mass is a solid object, or if composed of dust or gas. Additional follow-up observations may involve the ground-based Green Bank Telescope, the Very Large Array Radio Telescope, and future orbital telescopes dedicated to exoplanetology such as WFIRST, TESS, and PLATO. A fund-raising campaign was led by Tabetha Boyajian, the author of the initial study on KIC 8462852’s anomalous light curve. The project proposes to use the Las Cumbres Observatory Global Telescope Network to continue observation of the star in the future and observe it in additional wavelengths to reveal new details on the composition of the objects obfuscating the star. The campaign raised over US$100,000, enough for one year of observations. In October 2015, the SETI Institute used the Allen Telescope Array to look for radio emissions from possible intelligent extraterrestrial life in the vicinity of the star. After an initial two-week survey, the SETI Institute reported that it found no evidence of technology-related radio signals from the star system. No narrowband radio signals were found at a level of 180–300 Jy in a 1 Hz channel, or medium-band signals above 10 Jy in a 100 kHz channel. Another SETI-related study, one using archival VERITAS gamma-ray observatory observations from 2009 to 2015, found no evidence of pulsed optical beacons associated with KIC 8462852. Astronomer Jason Wright and his colleagues plan to conduct another search beginning in October 2016 using West Virginia’s Green Bank Telescope. A star called EPIC 204278916, as well as some other young stellar objects, was observed to have similar dips to those observed in KIC 8462852. However, they differ in many aspects. EPIC 204278916 shows much deeper dips than KIC 8462852, and the dips seem to be grouped over a short period of time, whereas the dips at KIC 8462852 are spread out over several years. Further, EPIC 204278916 is surrounded by a proto-stellar disc, while KIC 8462852 appears to be a normal F-type star displaying no evidence of a disc. Strange messages coming from the stars are ‘probably’ from aliens, scientists say. ‘It is too early to unequivocally attribute these purported signals to the activities of extraterrestrial civilizations,’ a group of scientists looking for aliens have warned – but the signals are encouraging. The new study reports the finding of specific modulations in just 234 out of the 2.5 million stars that have been observed during a survey of the sky. The work found that a tiny fraction of them seemed to be behaving strangely…….